Is West Coast really the best coast? 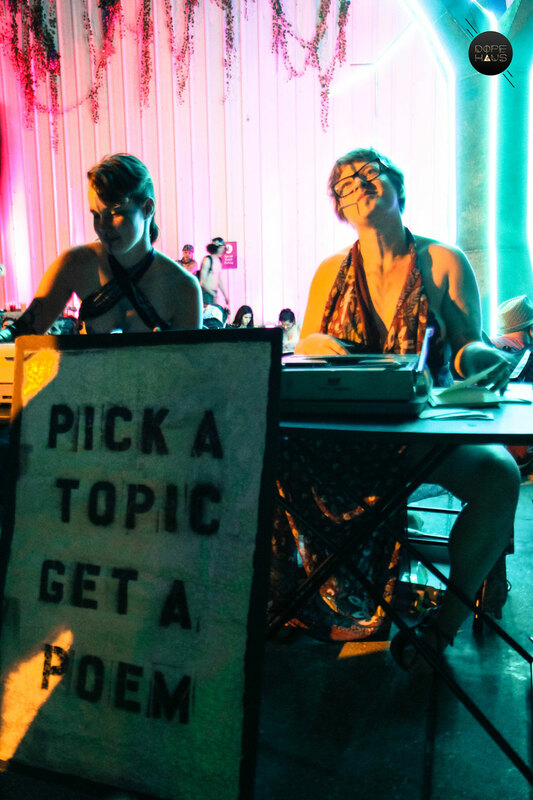 Here’s why you should look beyond the Pacific Northwest to BUKU Art + Music Project in New Orleans for your next festival adventure. Hosting 5 stages of electronic music and hip hop, BUKU festival happens one week after Mardi Gras and a week before St. Patrick’s Day in the middle of spring break madness. 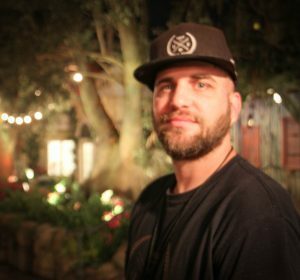 DOPE HAUS editor Chanel traveled to NOLA from “No Fun City” to see how the Dirty South gets busy in the Big Easy. “I hope that mirror doesn’t come crashing down,” I remarked to REZZ while washing my hands. I almost didn’t recognize her reflection in the bathroom mirror rattling wildly from the bass next door. 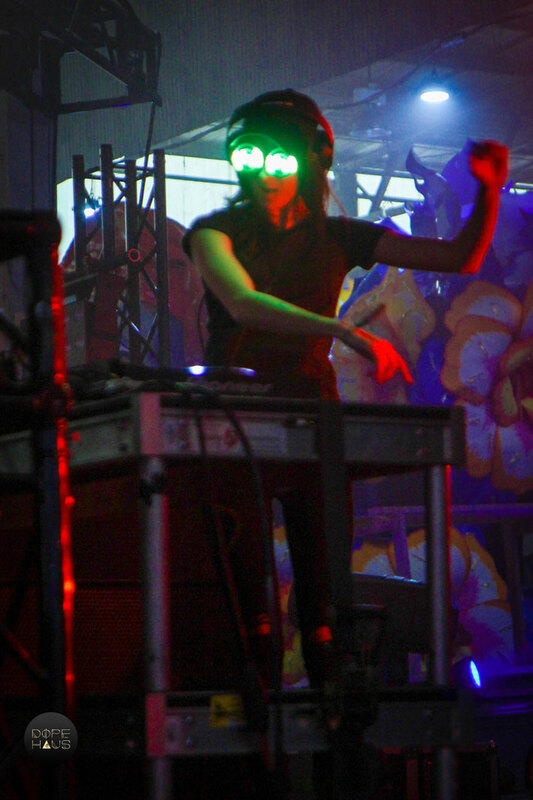 She wasn’t wearing the trademark LED glasses but the hat gave her away. 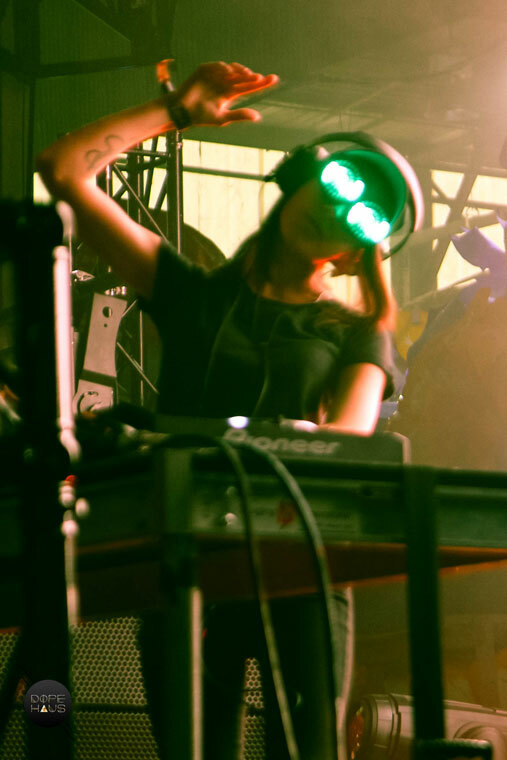 After pondering the structural integrity of the walls, REZZ scooted to the Float Den stage to take her turn pounding the building with bass from behind the decks. “WATCH OUT!” shouted a voice from behind my shoulder in the photo pit at the Power Plant stage. It was too late. 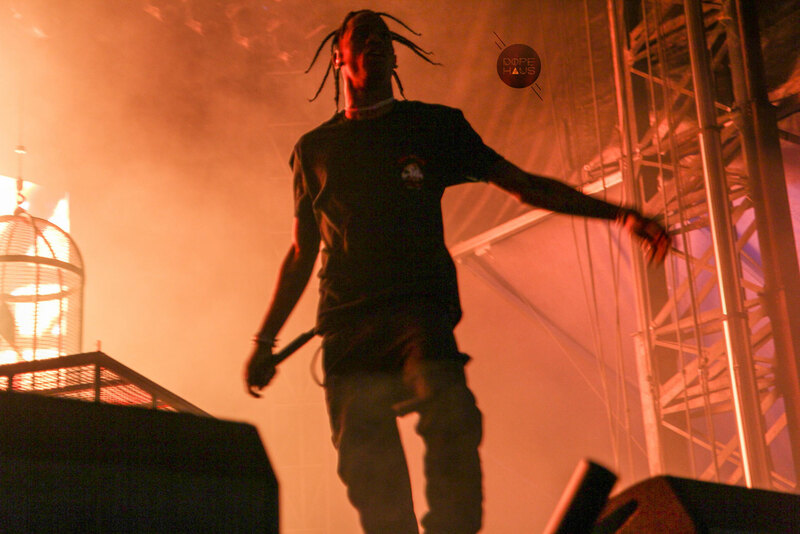 Before I could pull away from my camera’s viewfinder, Travis Scott burst onto the stage and drop kicked the mic stand, sending it hurtling in my direction. 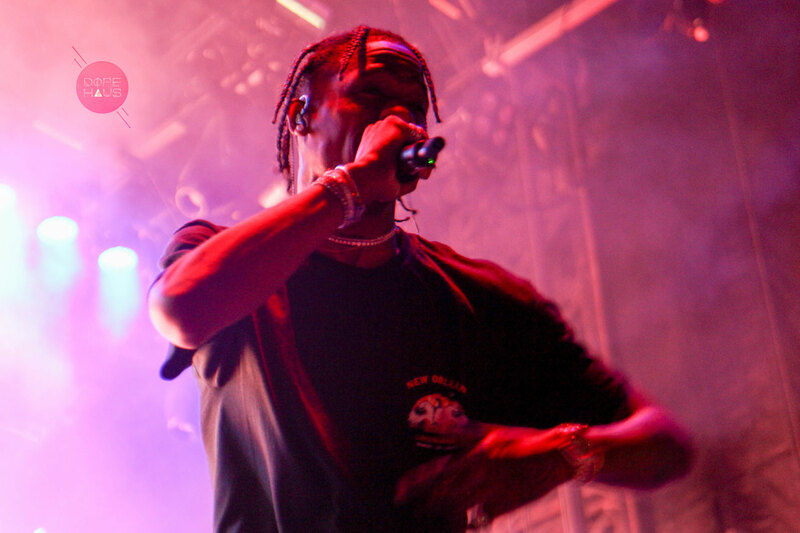 Bird cages hung behind him on stage, echoing visuals from his album Birds in the Trap Sing McKnight. 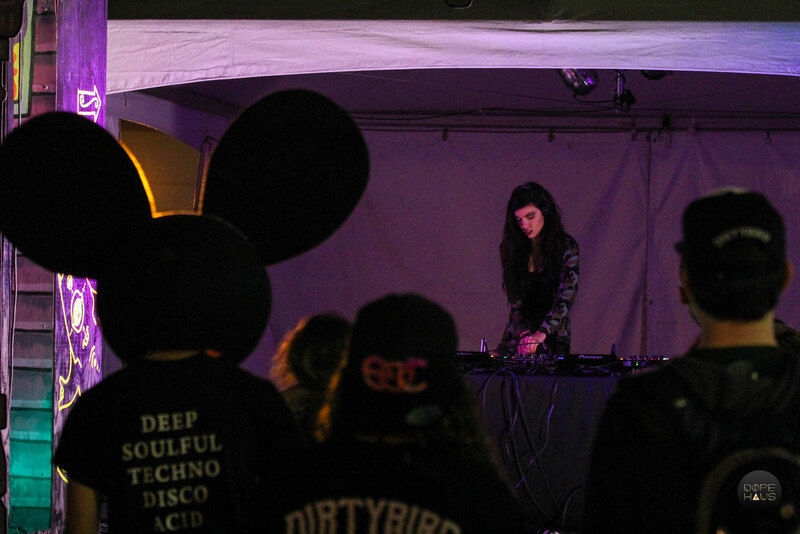 Bubblegum electro producer SOPHIE packed the Back Alley stage to the brim playing an energetic set of originals mixed with jump-up bangers. 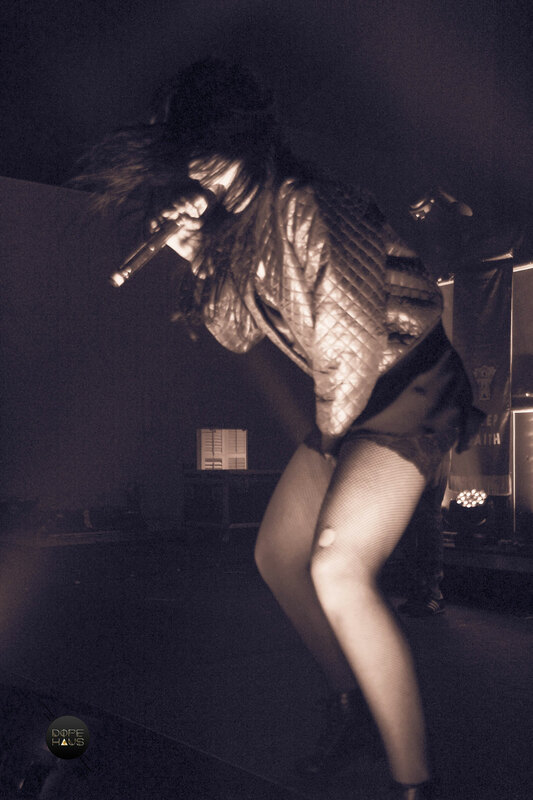 After wandering into the Ball Room stage, I caught the last half of Sleigh Bells for a change of pace from the pulsating bass. 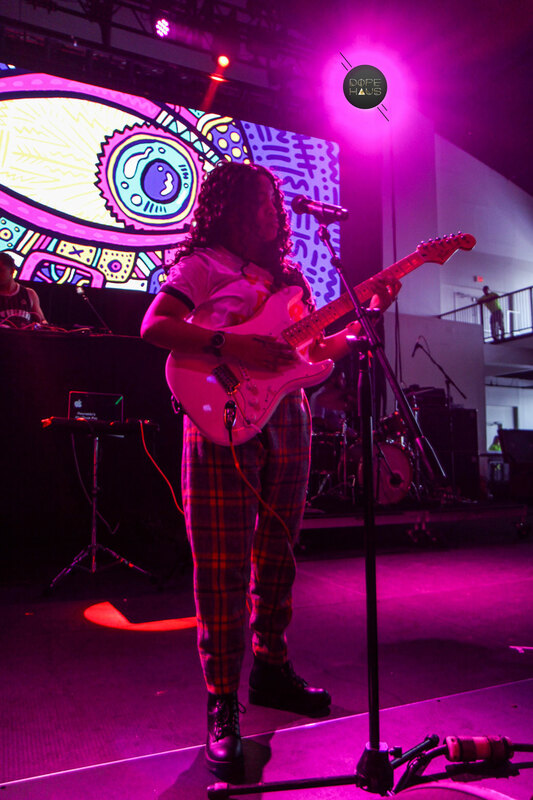 New Orlean’s local Ambre performed soulful R&B hits from her latest release 2090 early on Saturday. 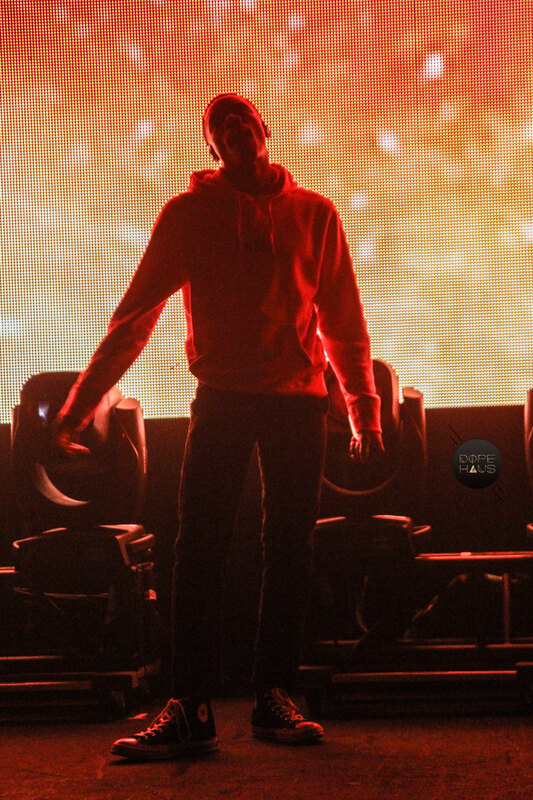 Later that night, Vince Staples performed solo on stage backlit by hellish orange light. 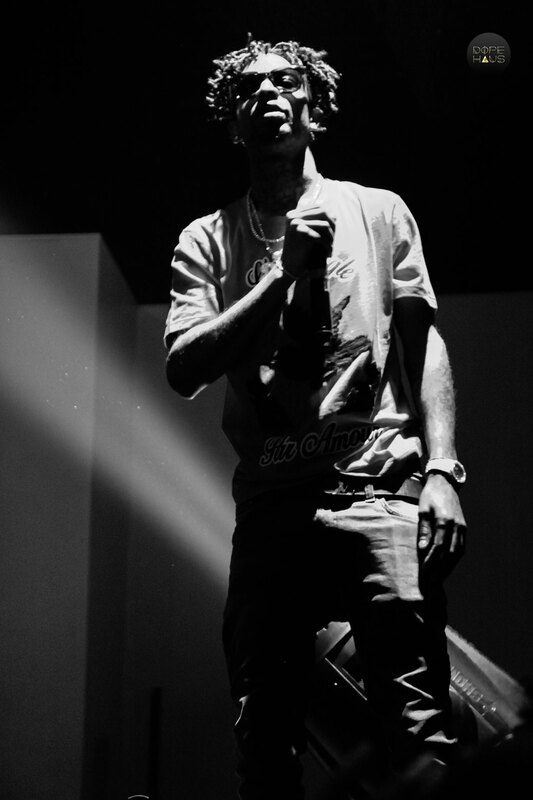 His silhouette haunted the stage with no accompaniment from a DJ or hype man, no frills and no extras. 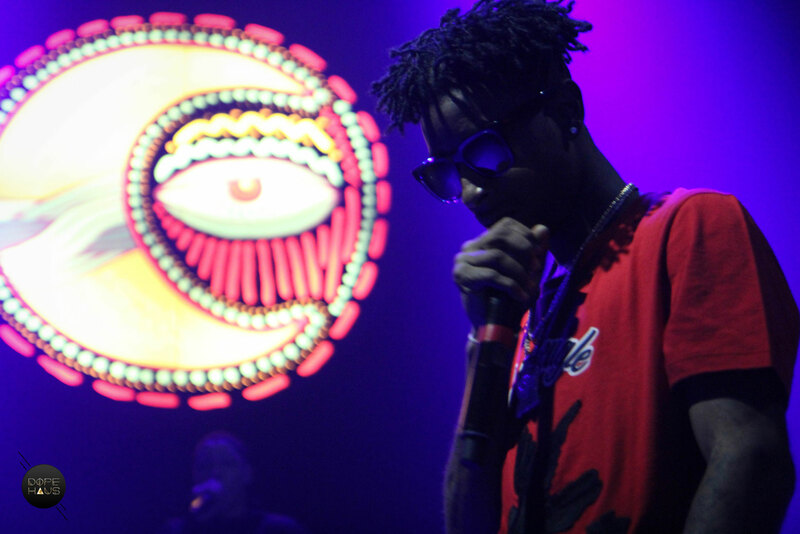 In contrast, 21 Savage mobbed the stage with his entourage 21 minutes late into his set. 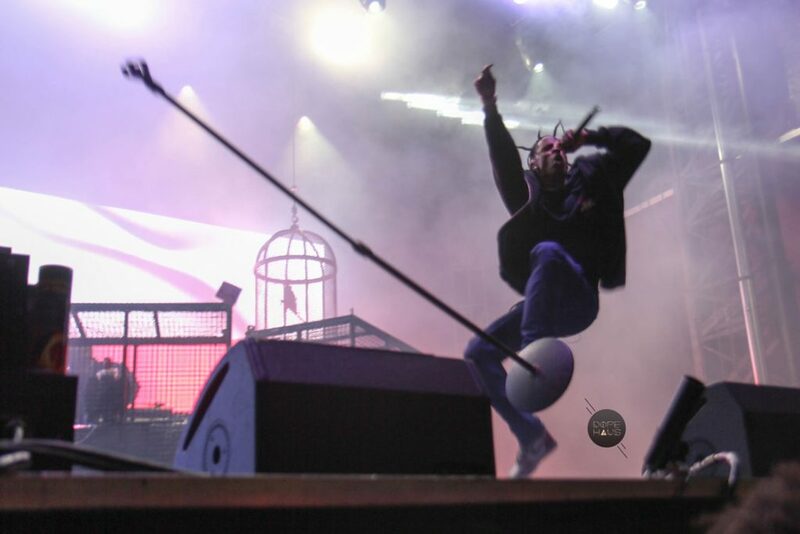 The DJ did his best to keep the crowd hyped while the audience’s anticipation grew to see the final hip hop headliner of the festival. 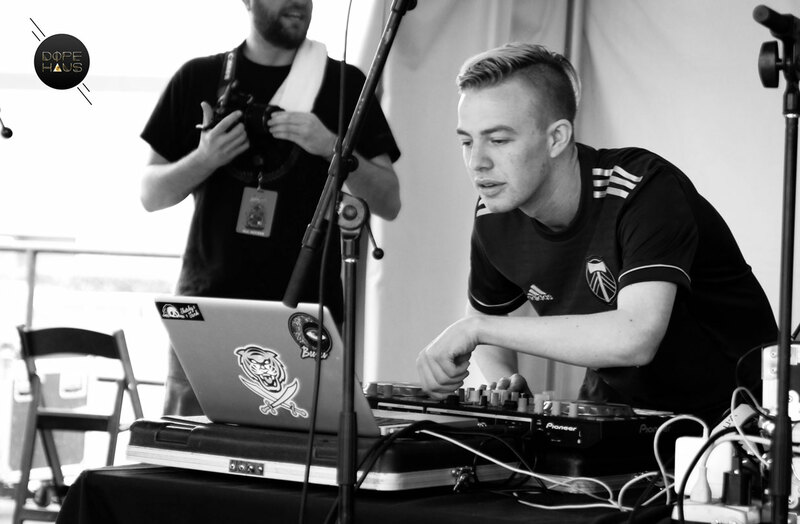 Label showcases at the Front Porch stage featured a taste of New Orleans residents from groups like Techno Club NOLA and graduates from Matthew Zarba’s Upbeat Academy. 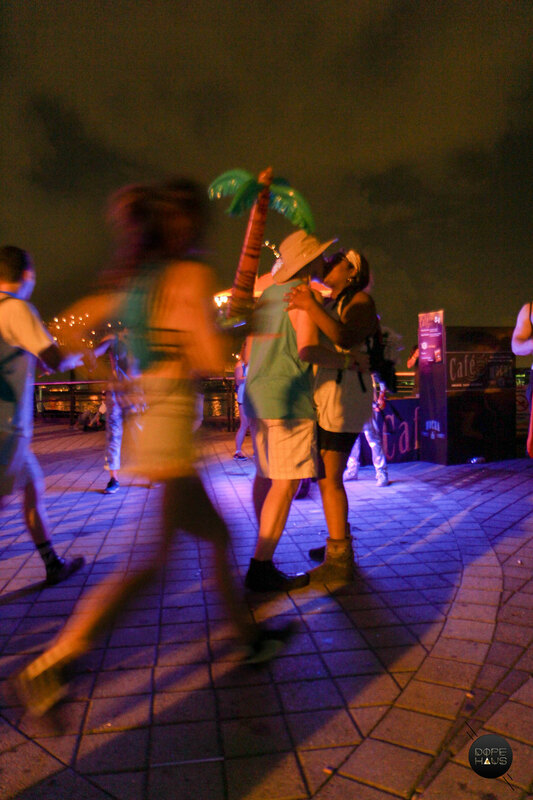 BUKU fest included the right mix of hip hop and electronic music while maintaining a healthy blend of headliners and locals between five stages. TICK-TICK-TAP-TICK-TICK-TAP-TING! 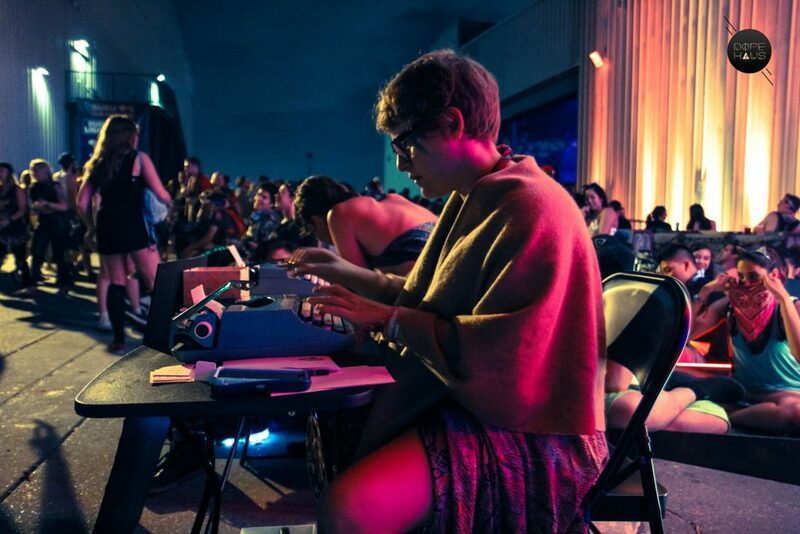 Did I just hear a typewriter in the middle of a music festival? Her fingers flew across the keys. 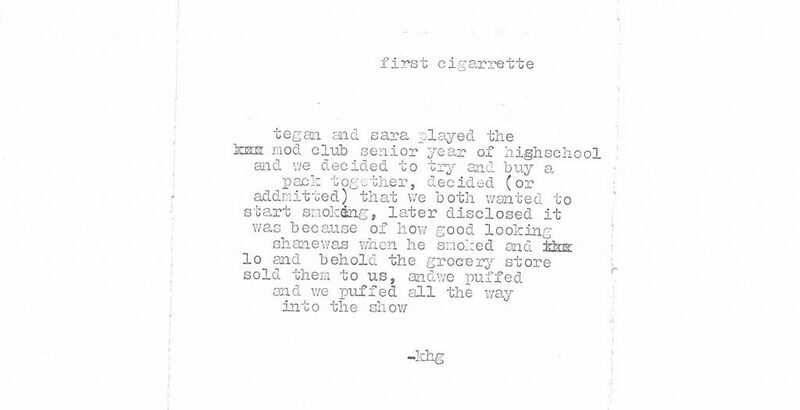 She tucked the poem in a little white envelope and sealed it with candle wax. 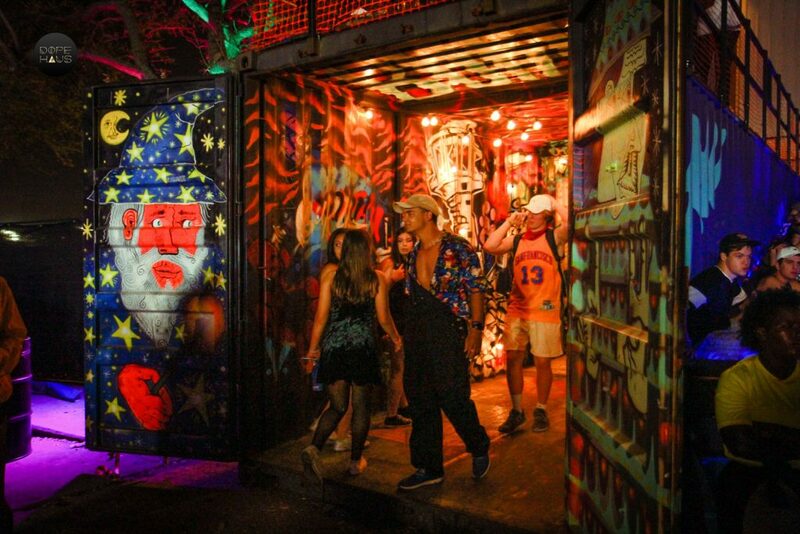 The massive graffiti wall suspended above the bar is the first thing you encounter when you enter the festival grounds. 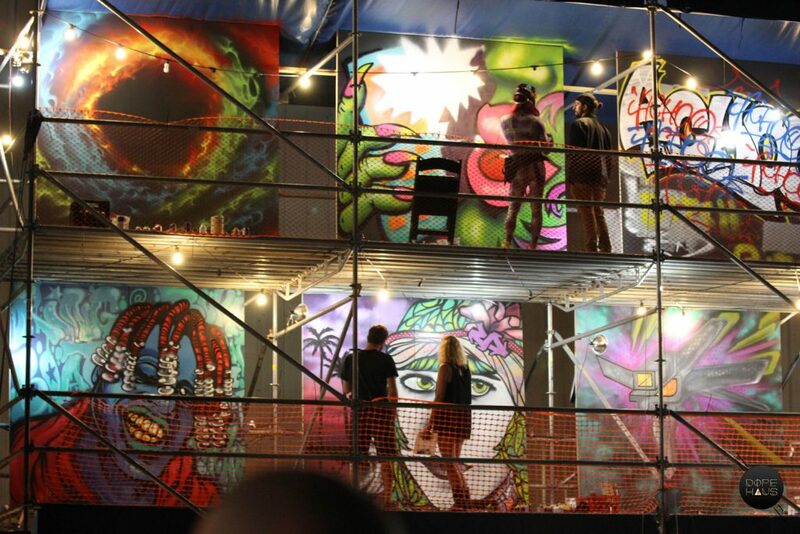 Artists worked tirelessly throughout the festival spray painting works of art that were auctioned off at the tent below. Beside the wall were shipping containers decorated in colourful graffiti that lended well to the trendy BUKU aesthetic. A set of stairs led up on top of the shipping containers for a better vantage point to view the Power Plant stage. Netting draped between the two shipping containers provided a giant hammock chill out spot. 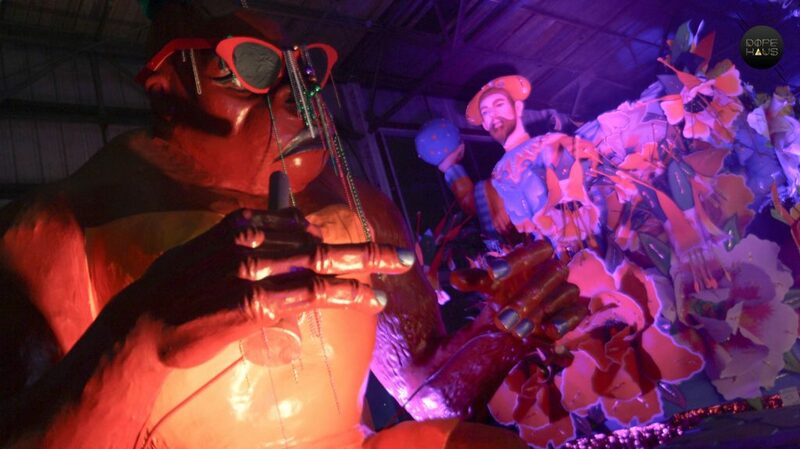 BUKU festival happens not far from the French Quarter in New Orleans at Mardi Gras World. 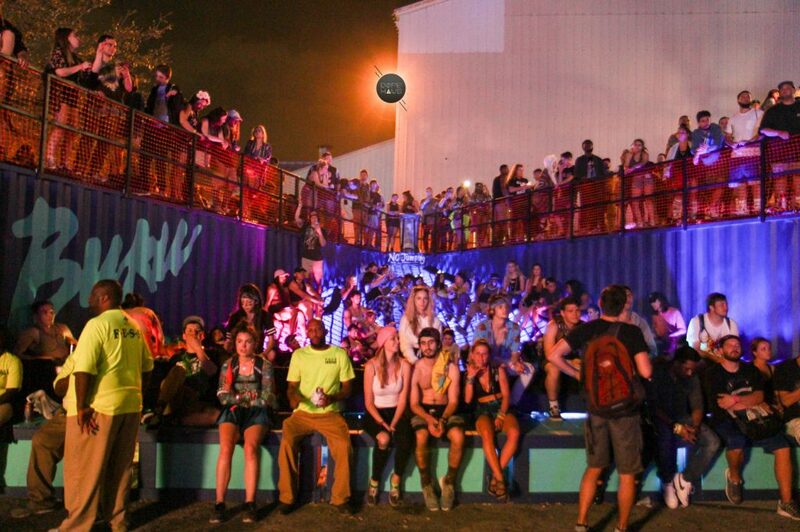 The Float Den stage, home to most of the headlining EDM acts, is a 30,000 sq. ft. warehouse that constructs and stores the world famous Mardi Gras floats. It made for a trippy setting amongst all the candy kids, LED hula hoops, glovers and colourful bass lovers. A 50 foot hip hop King Kong towered above me in the chaos of Slushii’s Float Den set. Mardi Gras beads fresh from the previous week’s celebration hung from the flamboyant floats like strings of sparkles in the rave lights, swaying to the bass from the powerful soundsystem. “DO NOT JUMP IN THE WATER,” a sign cautioned from the railing outside the Float Den. 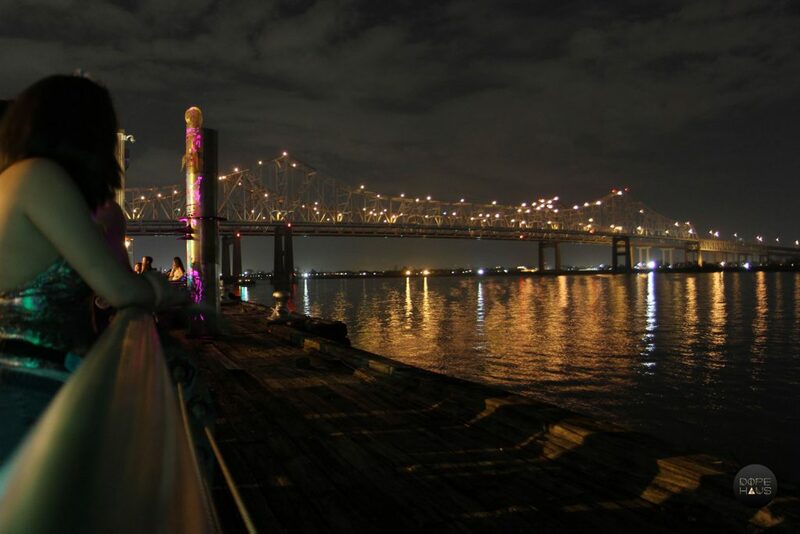 Beyond the railing, city lights twinkled off the Mississippi River. Freighters and steam boats sliced through the strong current below the Crescent City Connection bridge. WWSSHSHSHHHHH – a coast guard boat pulled up and crashed the party, unloading divers and first responders onto the dock. Moments before I arrived outside, someone jumped into the river. Was it a full moon? I couldn’t tell behind the clouds. Full disclosure: I hate camping. For pussies like myself who love to travel but hate to camp, BUKU is the ideal festival vacation. 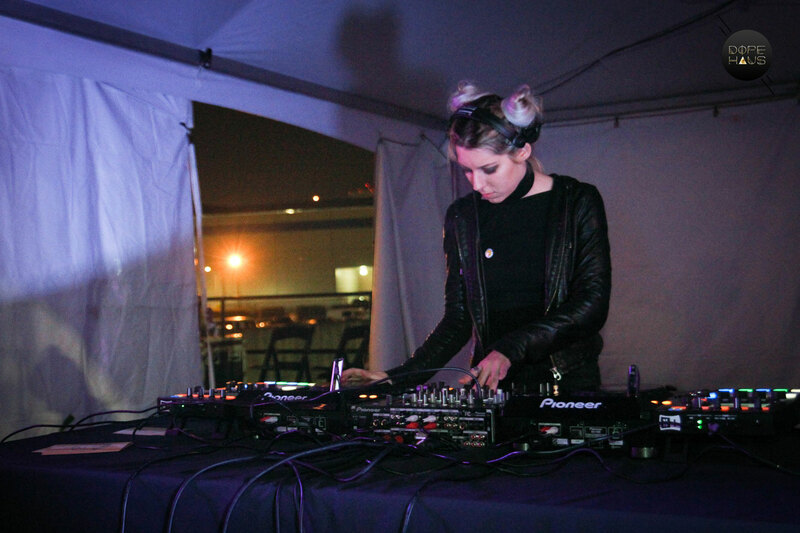 BUKU prides itself in hosting a house party vibe throughout the two day festival. 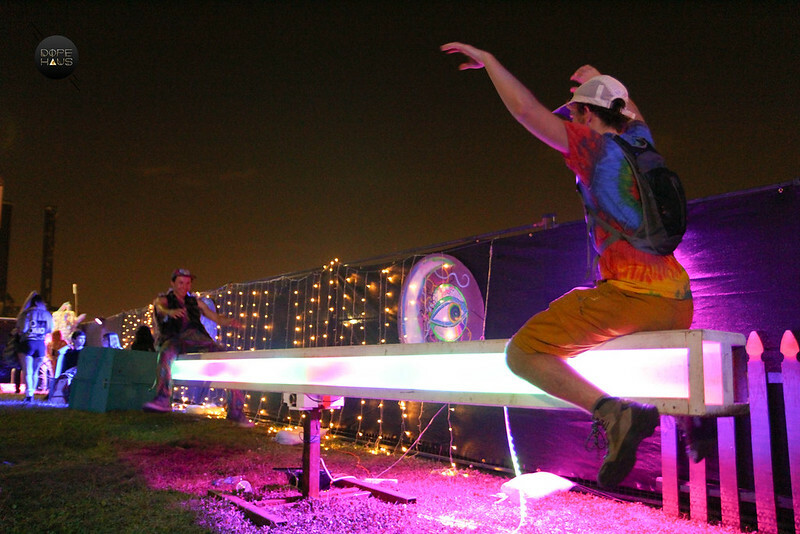 The short duration of the event allows you to explore the city outside festival grounds with little effort. 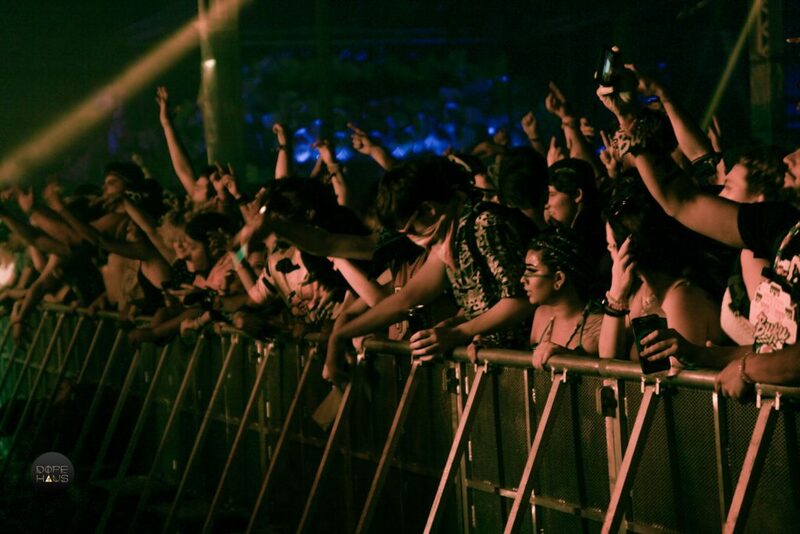 BUKU fest also provides free drinking water, a necessity at any music festival. 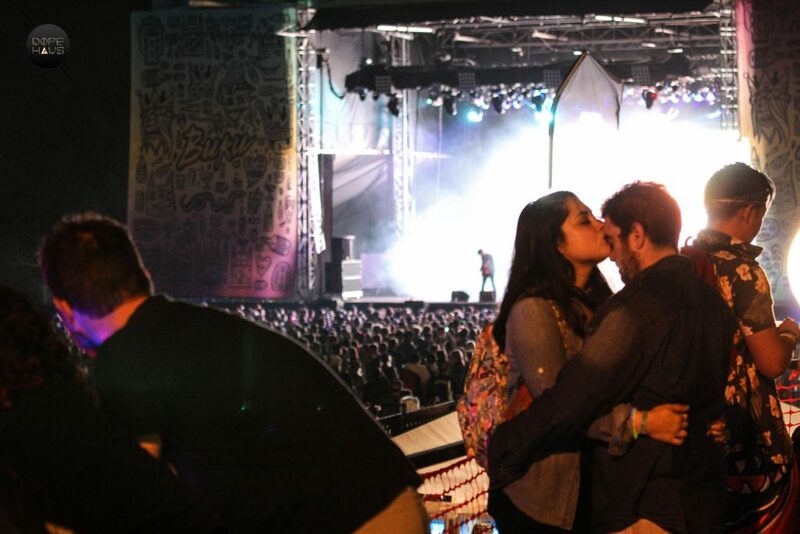 If you are sweaty and overheated, find a headlining hip hop act and head to the front of the stage by the photo pit. The artists will be happy to oblige you with a free shower hurled from a crushed Dasani water bottle. 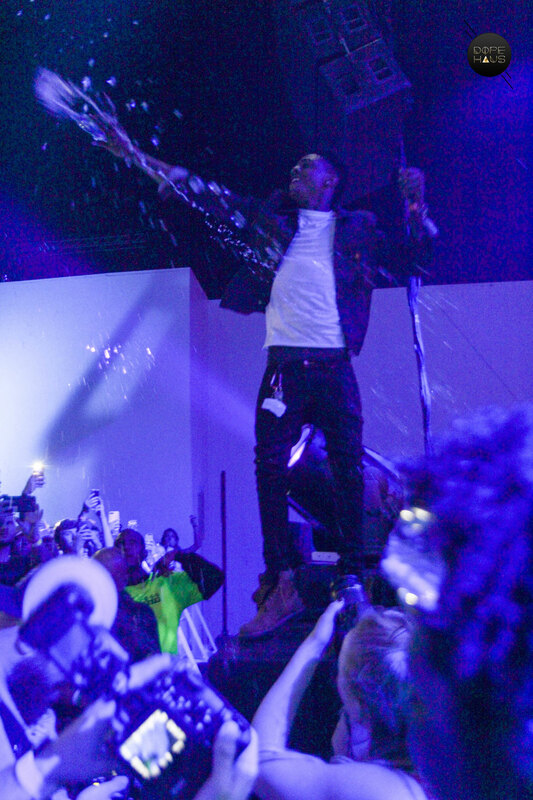 Big thanks to Travis Scott, Lil Yachty and a member of 21 Savage’s entourage for hosing us down in the press pit. An experience I’ll never forget. See you next year, BUKU!